On a seasonally adjusted basis, the Consumer Price Index for All Urban Consumers (CPI-U) rose 0.4 percent in November, the U.S. Bureau of Labor Statistics reported today. Over the last 12 months the index increased 1.8 percent before seasonal adjustment, the first positive 12-month change since February 2009. Core was a literal zero. Food was up a bit, but I continued to be puzzled by the difference between gasoline and "fuel oil." Why? Because "fuel oil" (that is, heating oil) is exactly the same thing as #2 diesel – that is, road diesel fuel. The only difference is the tax (and the presence of dye in the heating oil to denote that the tax has not been paid.) But for the legal (tax) issues you can run "heating oil" in your diesel car or truck, and vice-versa – they are identical products. All in all a blah report – but given the PPI that’s expected – the fun and games in the CPI report resulting from yesterday’s PPI should show up in a month or two. A Reader Asks "How Did 558,000 People Lose Their Jobs When Only 190,000 Jobs Were Lost?" Here is an excerpt from today’s Bureau of Labor Statistics Non-farm Payrolls report. 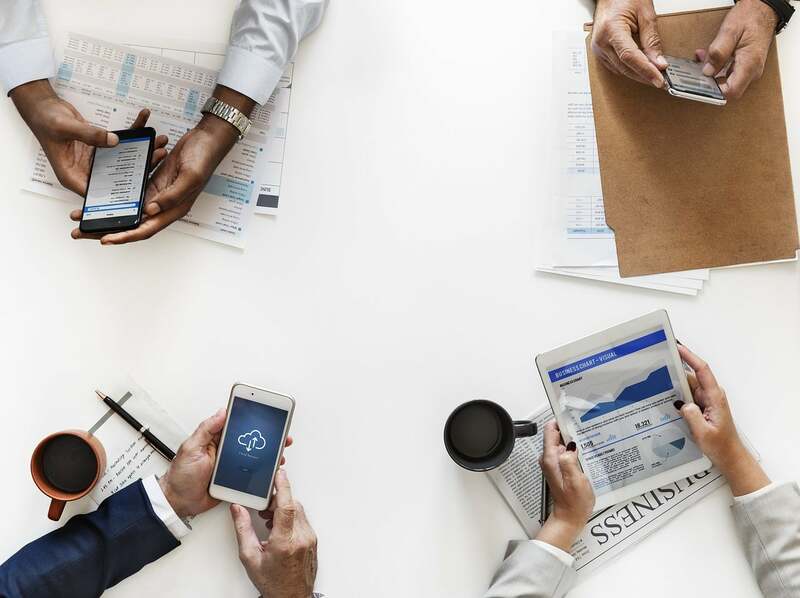 "The unemployment rate rose from 9.8 to 10.2 percent in October, and nonfarm payroll employment continued to decline (-190,000), the U.S. Bureau of Labor Statistics reported today. The largest job losses over the month were in construction, manufacturing, and retail trade. The civilian labor force participation rate was little changed over the month at 65.1 percent. The employment-population ratio continued to decline in October, falling to 58.5 percent." An astute reader noticed that the BLS press release says that 190,000 jobs were lost from payroll employment, but the number of unemployed persons increased by 558,000. What’s up with that? The BLS report consists of two independent data samples. 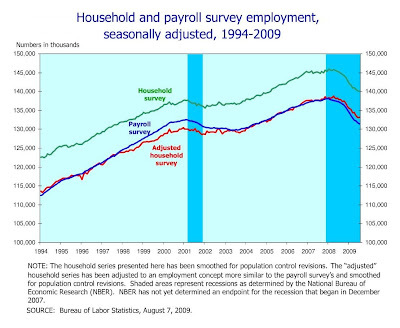 BLS has two monthly surveys that measure employment levels and trends: the Current Population Survey (CPS), also known as the household survey, and the Current Employment Statistics (CES) survey, also known as the payroll or establishment survey. There is the "Establishment Survey" which is based on responses from a sample of about 400,000 business establishments, about one-third of total nonfarm payroll employment. The headline payroll number, the job loss of 190,000, is based on this data. Then there is the "Household Survey" which is a statistical survey of more than 50,000 households with regard to the employment circumstances of their members, which is then applied to the estimates of the US population to obtain the unemployment number. This survey was started in the 1950′s and is conducted by the Census Bureau with the data being provided to BLS. It is from the household survey that more detailed information is obtained about employment statistics within population groups like gender and age, wages, and hours worked. It is this study that is responsible for the unemployment rate of 10.2%. "The ugly truth is that economics is a science in the way that medicine was a profession while it still used leeches to balance a person’s vapours. Yes, some are always better than others, and certainly more entertaining, but they all tended to kill their patients." US Personal Income has taken its worst annual decline since 1950. This is why it is an improbable fantasy to think that the consumer will be able to pull this economy out of recession using the normal ‘print and trickle down’ approach. In the 1950′s the solution was huge public works projects like the Interstate Highway System and of course the Korean War. Until the median wage improves relative to the cost of living, there will be no recovery. 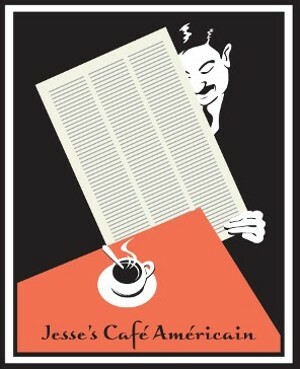 And by cost of living we do not mean the chimerical US Consumer Price Index. The classic Austrian prescription is to allow prices to decline until the median wage becomes adequate. Given the risk of a deflationary wage-price spiral, which is desired by no one except for the cash rich, the political risks of such an approach are enormous. On paper it is obvious that a market can ‘clear’ at a variety of levels, if wages and prices are allowed to move freely. After all, if profits are diminished, income can obviously be diminished by a proportional amount, and nothing has really changed in terms of viable consumption. The Supply side idealists (cash rich bosses, Austrians, Marxist, monetarist, and deflationist theorists) would like to see this happen at a lower level through a deflationary spiral. The Keynesians and neo-liberals wish to see it driven through the Demand side, with higher wages rising to meet the demands of profit in an inflationary expansion. Both believe that market forces alone can achieve this equilibrium. Across both groups runs a sub-category of statism vs. individualism. Unfortunately both groups are wrong. Another mixed bag of data this morning. Most alarming is the continuing trend in negative consumer data. As we all know by now, yesterday’s retail sales data was weak at best – something we’ve been reporting on here at TPC weekly thru our ICSC and Redbook data reports. Consumer sentiment readings continue to trend in-line with broader spending habits. This morning’s reading came in at 63.2 – almost 5 points below consensus. This continues to represent the broader economic themes we are seeing; deflation in the things we own and inflation in the things we need. 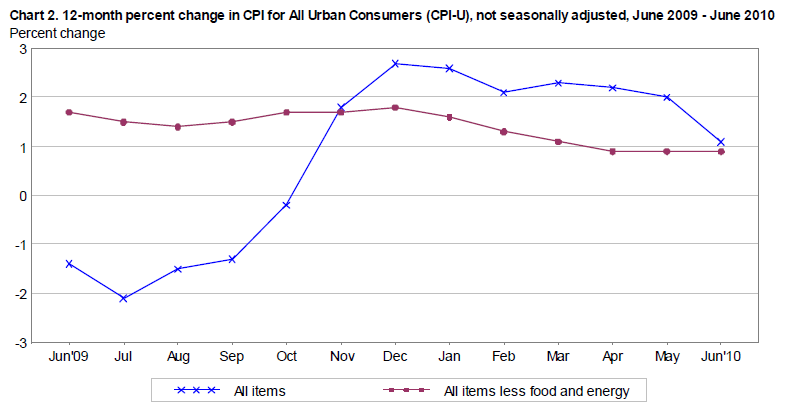 CPI came in flat which is reflective of the sluggish economy. This morning’s data was in-line with estimates at 0%. The lack of pricing power across the broad economy is in-line with the lack of expansion in corporate revenues. 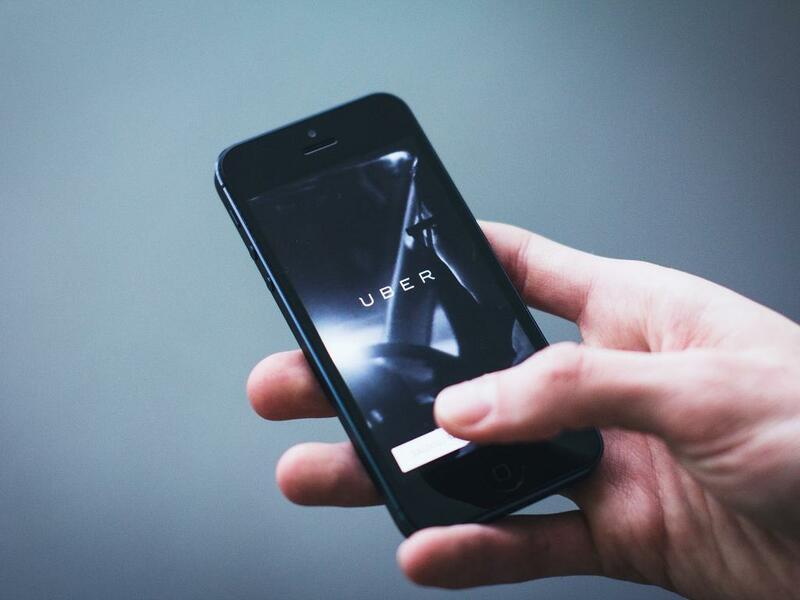 There is little demand for goods and even less pricing power. I’d love to spin this into a positive, but it simply displays the death grip that deflation continues to maintain on the broad economy. On the bright side, capacity utilization and industrial production posted slight improvements. This is a clear sign that the recession is likely to end in the upcoming quarter. Unfortunately, the rebound in both indicators show clear signs of the sluggish and below trend recovery we are likely to see. It won’t be a technical recession, but it will probably continue to feel like one. All in all, this morning’s data nicely summarizes the themes we continue to focus on here at TPC. The consumer is weak, deflation remains the bigger concern and the recovery (if we can call it that) is likely to be far from v-shaped. As for the markets, complacency remains the name of the game. Own equities at your own risk – which I believe are highly elevated currently…. Here’s a couple from Jake at Econompic Data - on CPI expectations and net worth per capita. Prices of imported goods fell 0.7% in July, the first decrease since January as petroleum prices declined, the Labor Department estimated Thursday. Analysts polled by MarketWatch had expected the import price index to fall 0.1%. Import prices were down 19.3% in the past year, the largest annual decline since the data were first published in 1982. In June, the import price index rose a revised 2.6%, compared with a prior estimate of a 3.2% gain. In July, imported petroleum prices fell 2.8%, the first decrease since January. The petroleum imports price index is down 49.9% over 12 months. Non-petroleum import prices fell 0.2% in July, and are down 7.3% for the year, the largest 12-month decline since the data began publication in 1985. We can see below that the change in the import price level was largely driven by the change in fuel (i.e. petroleum) prices. Now the significance. There has been a very strong relationship between the price level of imports and broad CPI, as changes in the price of petroleum has been the main driver of CPI. Thus, the fact that July’s import prices declined makes me think we may be in for a surprise regarding July’s CPI print. The below chart shows the longer term relationship. Regardless of the month over month figure, expect a sizable drop in the year over year number. As we can see below, prices spiked last July as the bubble in oil was in full gear. 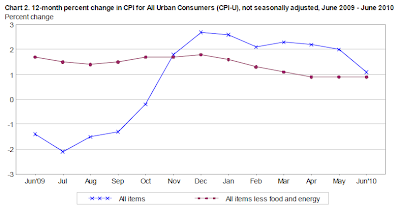 Thus, if prices are flat month over month (as expected), the year over year CPI will move down to -1.9%. 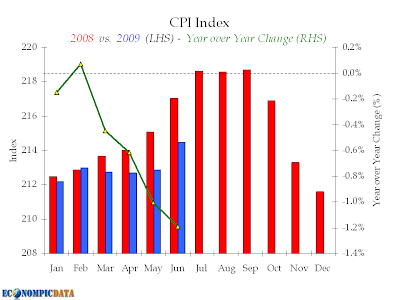 Inquiring minds are asking "What is the Real CPI?" It’s a good question, too. However, you can find many widely differing opinions. For example, you will get one answer from the government, a different answer from sites like Shadowstats, and a third opinion from me. First let’s look at John Williams’ Shadowstats . That’s an interesting chart, especially given the hyperinflationary bent of John Williams. 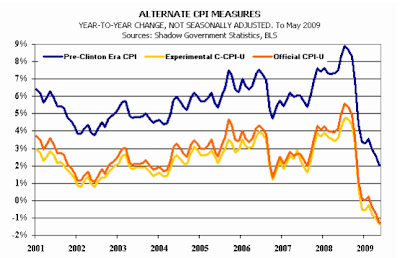 He pegs the CPI at 2% as of May 2009 and had it at 9% mid-2008 and right around 5% in 2007. 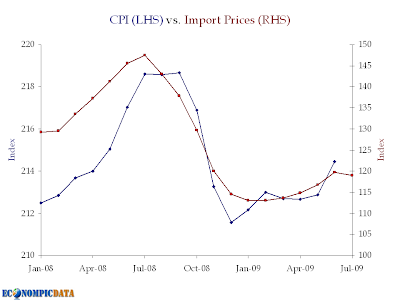 In contrast, the official CPI was 5.5% in mid-2008 and 2+% in 2007. The problem with all of those numbers is they fail to properly take housing into consideration. And housing has been falling like a rock. Should housing be in the CPI? How? Bear in mind the government considers housing a capital good not a consumption item. Based on the idea that one would be renting a house if one did not own it, the government uses Owners Equivalent Rent (OER) and not housing prices in the CPI. OER is the largest component in the CPI. By the same measure one might argue that lawn mowers and automobiles are capital goods. Lawn mowers are durable, not immediately consumed, and if one owns buildings and uses lawn mowers to maintain their properties (or if one hired someone to cut their lawns for them), the mowers would indeed be depreciated over time as a capital expense. The same logic also applies to auto leases. Let’s explore this from a practical standpoint starting with theory. Here are a few excerpts of note from the Consumer Price Index Manual, Theory and Practice By Ralph Turvey. Page 47: The treatment of owner occupied housing is difficult and somewhat controversial. There may be no consensus on what is the best practice. The distinctive feature is that it requires the use of an extremely large fixed asset in the form of the dwelling itself. Page 147: The treatment of owner-occupied housing is arguably the most difficult issue faced by CPI-compilers. Equally important it may be difficult to identify a single principal purpose for the CPI.